Telephone and power lines easily can be confused for one another as they run along tall wooden polls encased in black rubber, but they are beasts of very different natures. The distinguishing characteristics of telephones lines and power cables are attributable to the primary difference between the two, which is their divergent purposes. Other differences between the two include the level of power output and the technology employed by each. Power lines are the subject of disease controversies while phone lines are not. The most obvious difference between phone lines and power cables is their different purposes. These purposes can be easily stated as transmitting power (power cable) and transmitting phone signals (phone line). A more complex description reveals that power cables are exclusively one-way: they relay power from the point of origin to various buildings and homes on the power grid. Telephone lines, on the other hand, are responsible for two-way communication and must relay phone signals both to and from a building or home to facilitate conversation. Power cables have a much higher energy outlet level than do telephone lines. The reason for this is that power cables must relay enough power from the source to various recipients to power all of the homes and buildings along the cables' route. Thus at any given point in time or space, a power cable is relaying enough electricity to power several buildings. Telephone lines, on the other hand, don't provide electricity. Rather, they transmit signals. The power output of telephones lines is only enough to relay a phone signal and is thus very low. Telephone cables are not prone to power surges on account of this whereas power cables are. 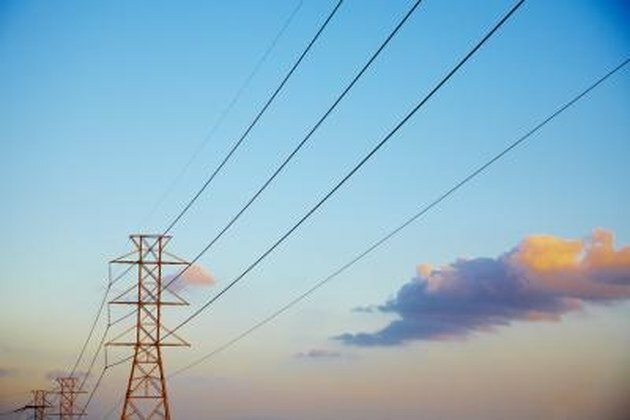 Power cables and telephone lines are built from very different materials. Power cables are most commonly built of aluminum that is surrounded by steel. Aluminum is a tremendous conductor of electricity but is very weak. In power cable construction, steel cables designed to protect the aluminum from strong winds, ice and other elements surround a central aluminum conductor. Two primary types of telephone cables are available, both of which are made from copper and both of which are used to transmit television signals in addition to telephone signals. These types are ADSL and coaxial. ADSL cables are also capable of transmitting Internet information.